Taxes filed, refund expected and odds are, you’ve already spent it ten different ways in your mind, yes? But before you buy that new jet ski or handbag, we have a few ideas you might want to consider. As we all know, these days, protecting our credit rating is as important as ever. The new credit laws have changed not only the way we spend, but in many ways, it changed the way we save. Maybe it’s the unpredictability of life or maybe the recent recession that taught us all a bit about budgeting and spending control, but regardless, it’s all about covering today’s financial bases and just as importantly, tomorrow’s financial bases too. In a recent post – Taking Advantage of National Financial Literacy Month, we talked about how April is National Financial Literacy Month and provided a few tips to take control over your financial health. Keeping with that same tone, here are a few ideas of how spending your tax refund wisely can affect you ten -or more -years from now. Of course, our first tip is all about paying down credit card balances. This is important on several fronts. First, we never know when a tough financial moment will strike. Even with the most confidence in our job security, the truth is, life tends to be a bit unpredictable. Covering those bases when the bank balance is a bit higher is always a good thing – and certainly a responsible thing. You’re eliminating debt, reducing interest and improving your credit score. Not only that, but you’ll sleep better knowing your credit card balance is a bit lower. When you’re really being honest with yourself, you’re able to take a long hard look at your choices from a different perspective. While the thought of the new technological gadget will add to your Facebook or Twitter experience, a year from now, will it really matter? The fact is, today’s must have is just tomorrow’s has been, especially when it comes to electronics like computers and smart phones. But what if you applied that same dollar amount that today’s new iPhone release costs to your credit card balance? A year from now, you’ll notice a couple of things: first, you’ll all those must-haves from last year are now on Craigslist at big savings and more importantly, you’ll see a big change in how much interest you paid on your credit card and how it affected your credit card statements the past several months. It’s hard to argue with the logic we sell ourselves sometimes. It’s easy to convince ourselves, “I work hard every day and I deserve to splurge.” And you’re right. But how much of your credit card debt now exists because of that mindset? Remember the weekend getaway six months ago that you charged on your American Express? Wasn’t it the mindset of “I deserve it” that made it easy then too? The truth is, we all work hard for what we have and those splurges, frankly, is what keeps most of us sane or at a minimum, is what drives us to get up each day and spend it in an office or on a pipeline or caring for patients in a hospital. But when we can find that healthy middle ground, the right perspective, so to speak, it’s then we know we’re running our lives and not allowing our debt to determine our decisions. That’s powerful and once you have it, it’s not something you’re willing to let go of. 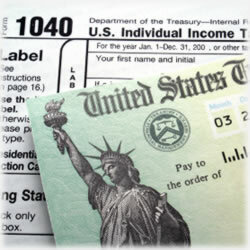 The bottom line is we all can decide what we do with that long-awaited tax refund check. And too, when it comes right down to it, no one owes anyone else an explanation for what it is they do with the money they’ve overpaid the government, but once you decide it’s not “extra” money, but rather, part of your salary that you’ve earned, it does become a bit easier to rethink the best way to spend or invest it. Making the decision to pay down debt could mean the difference in what your next mortgage costs you or how sweet the next credit card offer is. In the end, it’s those little things that make all the difference in our quality of life.